“Something old, something new” best heralds the basic design philosophies of Paper+Cup Design. Founders, Minhee & Truman Cho have established a strong reputation for their fresh and innovative approach. Their work have been featured in numerous national periodicals, including InStyle, New York Times, Martha Stewart Weddings, Blueprint, Lucky, Domino, Cookie, Real Simple, Elegant Weddings, and more. Minhee has been featured in Lucky and Domino as a designer to watch and recently received industry recognition in the annual Print magazine’s design awards. 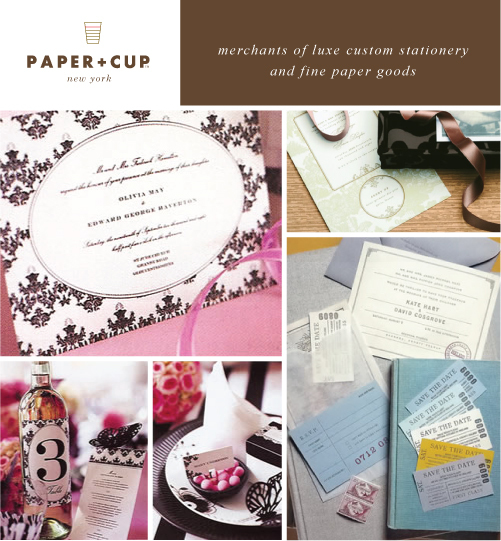 Paper+Cup offers a full custom service from invite design to help coordinating a theme for your special event. Designs are available for all price points and printing methods such as flat, letterpress and engraving. Visit the website to view the ready made Era collection or find out about our custom services.